Three Drawer Filing Cabinet with hidden compartment. Two Drawer option is available without hidden compartment. 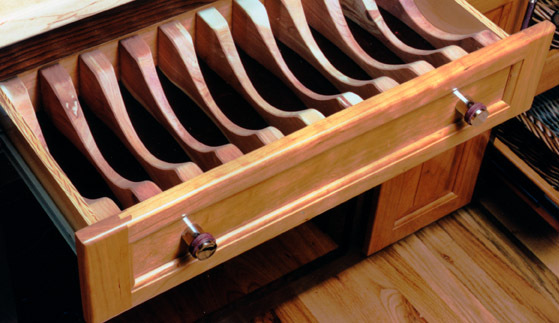 Hardrock Maple Drawers are made of dovetail construction with 150 pound load full extension slides. 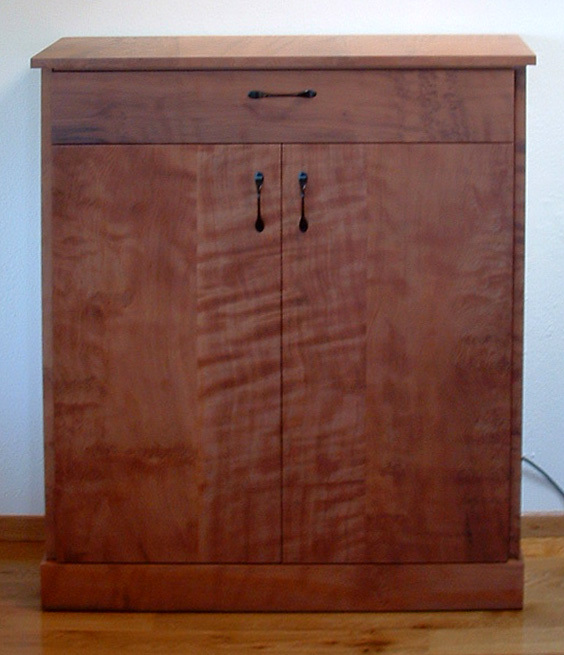 This filing cabinet features Canary Wood and Bubinga. 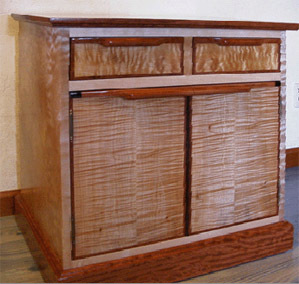 Canary Wood and Bubinga - $4495.00. Prices are estimates, fine woods market fluctuates. The two drawer option price is approximately $500.00 less. 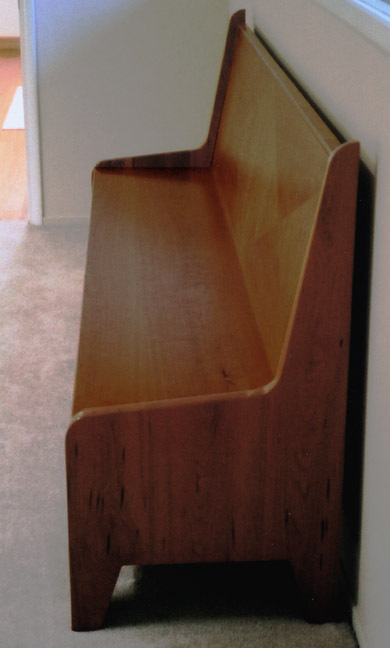 The Parsons Bench is made of solid Cherry with Cherry Veneers. 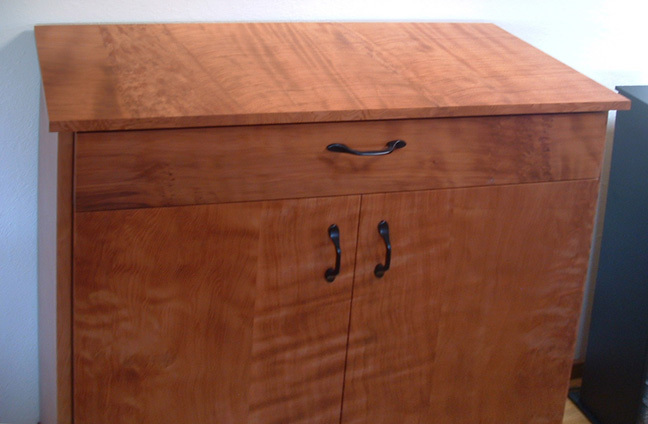 Even the dovetail construction drawers are solid cherry wood. Perfect for displaying plates, bowls and glassware, especially with the halogen lighting. Wood-edged glass shelves are adjustable. Drawers constructed of aromatic cedar. 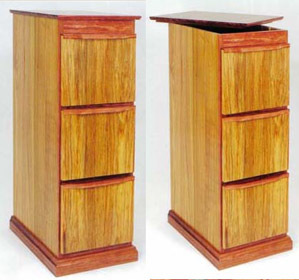 Base unit cupboard includes one adjustable shelf. Rosewood highlights your choice of primary wood (see below). rosewood. 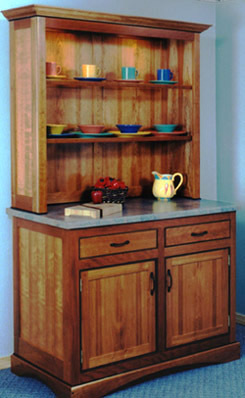 Hutch is constructed with solid wood work surface, granite is an option. Call to discuss granite option. An elegant relative of Mission Style, this bed has generous slats and is constructed of fine woods. 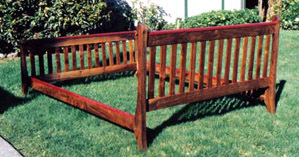 The four bed planks (not shown, support the mattress) are Aromatic Cedar for freshness and enjoyment. 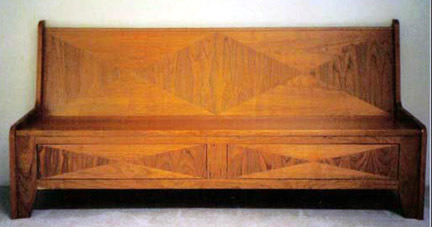 The Queen bed shown here is of Claro Walnut highlighted with Purple Heart. Claro Walnut is California Black Walnut which exhibits rich colors and grains due to the soils in which it grows. Unique Reproduction Antique Tall Chest of Drawers in White Oak designed according to a customer’s photograph. 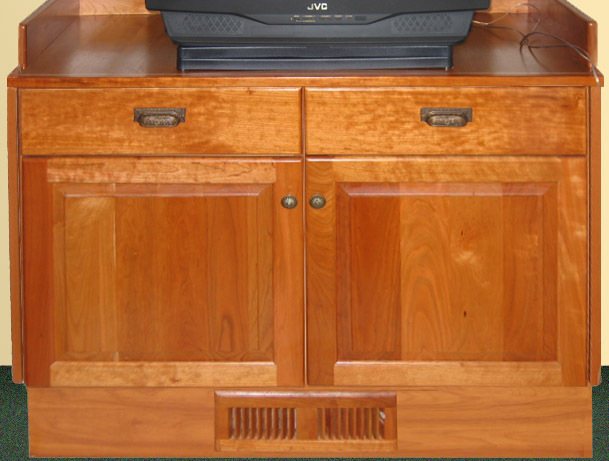 John’s Furniture and Cabinets works with fine wood suppliers and was able to nearly match the wood grain of the antique in the drawer faces. As in the original antique, the drawers are Hardrock Maple with dovetail construction, but enhanced with modern furniture grade full extension slides. Priced between $4795.00 and $5000.00. 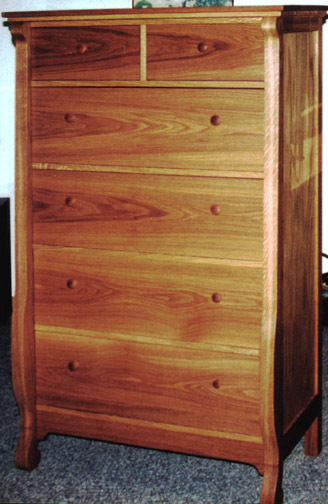 This Night Stand/End Table is of Curly Maple with Bubinga and Wenge. Wood selection and finishing present three aspects of Curly Maple - the top, middle and bottom rails are clean and smooth, the sides show the full figure of curly maple and the custom book-matched veneers on the drawer fronts and doors present the intense character of Curly Maple. 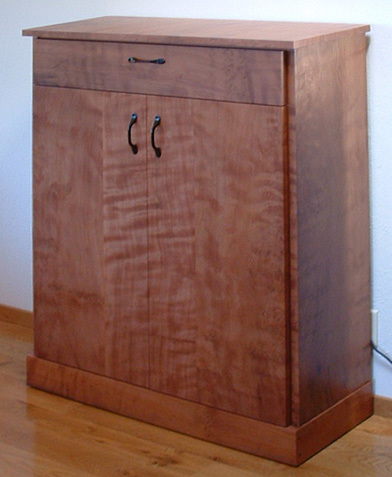 The Bubinga top, base, and custom pulls compliments the Curly Maple with its similar figuring. 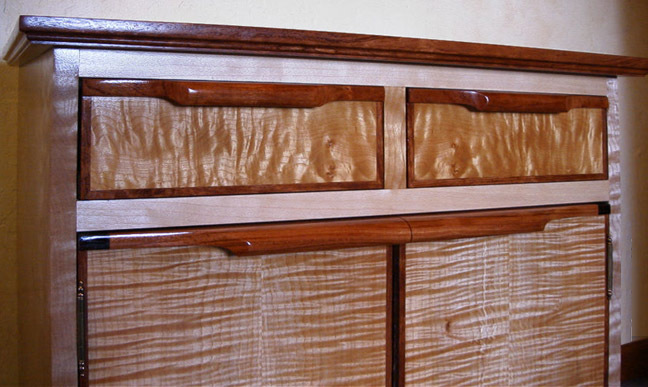 The dark Wenge in the center door reveal and at the tip of the door pulls provides an extra, formal touch. The hidden treasure is dovetail constructed drawers made of Aromatic Cedar.